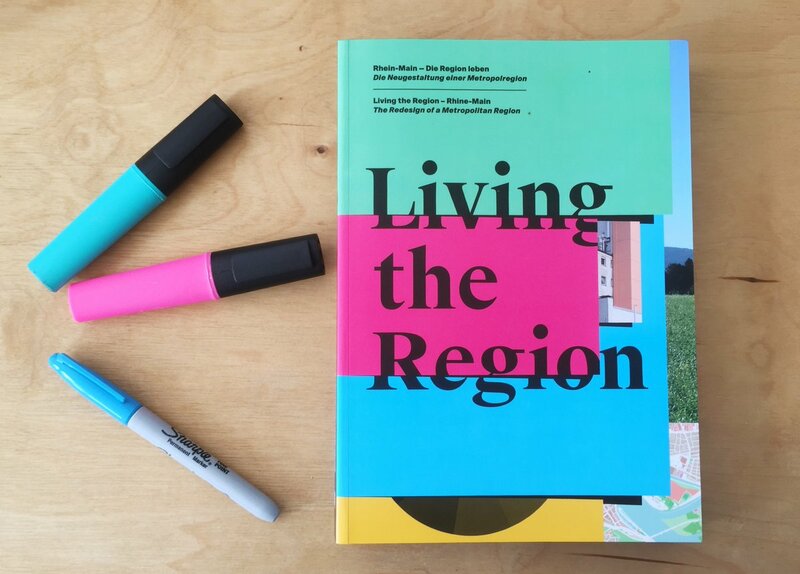 In November 2017 URBED were delighted to be invited to take part in the DAM- Lab workshop “Living the Region” at the Frankfurt Hypermotion fair. 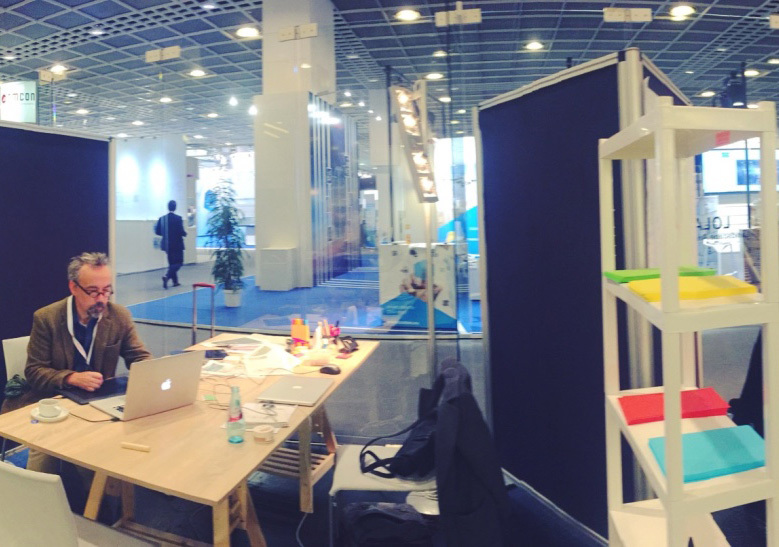 The workshop was organised by the Deutsches Architekturmuseum (DAM) and designed as live project taking place within the fair itself. URBED were one of five teams and were joined by AWP from Paris, LOLA Landscape Architects from Rotterdam, KCAP Architects&Planners from Rotterdam and feld72 from Vienna. Over three days we were tasked with developing a vision for the future of the Frankfurt RheinMain region, bringing together innovative housing and transport solutions. At the same time we also had to illustrate how this future vision might manifest itself at a smaller scale, by designing a conceptual urban quarter based on a fictitious town within the region. We had great deal of fun working on this project, sharing the workshop space with our international colleagues and exploring Frankfurt in the evenings. The workshop culminated in a short presentation by each of the teams, but the project doesn't end there! All five teams are now working up their concepts to be displayed in an exhibition in the DAM next year. We look forward to sharing our ideas and seeing what the other teams have developed. It wasn’t so long ago that urban visionaries were imagining the city of the future full of personal flying machines and hover cars. To some this conjured up a vision of the multi-storey mega city of Blade Runner or The Fifth Element, to others the endless expanse of Frank Lloyd-Wright’s Broad Acre. Well the jet packs never did arrive, but today people get just as excited about driverless cars, and drone deliveries, hyper loops and smart transport systems and there is much speculation about the sort of city that is likely to be created by this technology. A lot of this discussion is fatalistic, technology is unstoppable and there is nothing we can do but accept the impact on our cities. We don’t agree - while accepting the inevitability of technological change, we still have the ability (and the responsibility) to influence the way that it shapes our cities. Imagine a person waking up today in one of the small towns and villages around Frankfurt contemplating the day ahead. At the moment this involves getting into a car, driving through traffic to work or the shops, or perhaps to a station to catch a train into the city, working all day and then facing the same long stressful commute to get home. Imagine now a not-so-distant future where this journey will be managed by your smart phone, summoning a driverless car, interchanging with a tram or train and then linking up with a city bike at the other end, all with seamless interchange and a single pricing structure that is a fraction of the cost of that bloody car! What does this mean for the city, town and neighbourhood? In the future technology will allow easy multi-modal journeys and driverless technology will change the way we use our roads. We ask what this could mean for the region, the town and the neighbourhood. What sort of city do you want? Sitting, as we were at the Hypermotion workshop, in a glass box at the centre of an exhibition on future transport technology it seemed as though the future had already arrived and on the whole it would be driverless. But, if we plan the city for driverless cars, then that is the city that we will get. A city of cars is the same, regardless of whether or not they have drivers, because everywhere is equally accessibly. The city of cars quickly becomes a blob like Los Angeles. By contrast a city of trams and trains develops around stations and stretches out along the lines. A city of rails therefore becomes a star like Moscow or London. Frankfurt Main is neither of these things. It is a polycentric conurbation of six cities and a hundred or so smaller towns and villages with a huge airport at its centre – neither a star nor a blob. We believe that it is better to think of Frankfurt Main as a web, that links a variety of transport modes. It already has an excellent rail network but the problem is that the conurbation is dispersed and lots of people need their cars – and will continue to need some form of dispersed personal transport. The result is a conurbation dominated by roads crammed with traffic. The Web city, in our view, must therefore re-appropriate this road space. Over time this will mean transferring space from private cars to driverless cars and to public transport. It would happen gradually the private car being supplanted as alternatives are developed and traffic lanes can be given over to other modes. It would overlay the ‘star' of the railway infrastructure with the 'blob' of the road network with interchanges where they overlap to create a 'web’. Existing infrastructure used in news ways could create a flexible and sustainable network. What sort of town do you want? In a world where transport becomes a service that you can order-up we might also be able to reimagine the way that we organise our towns and neighbourhoods. The places we visited in Frankfurt Main were dominated by cars. Traffic clogged the main streets, residential layouts were turned inside-out to separate cars and pedestrians while huge areas were devoted to parking. What would happen, we wondered, if we reinstated the medieval wall around all of the small towns of the region and made people leave their car at the gate (in a convenient parking structure)? Within the town transport would be handled through a variety of means, bikes and walking obviously, the train or tram if there was a station, the small driverless buses that we saw in the exhibition shuttling back and forth to the gates. Delivery vehicles would leave their goods a loading bays in the parking structures to be delivered to each home by a fleet of robots or drones. The whole thing packaged up as an affordable service, convenient, integrated and available at your fingertips through your phone. 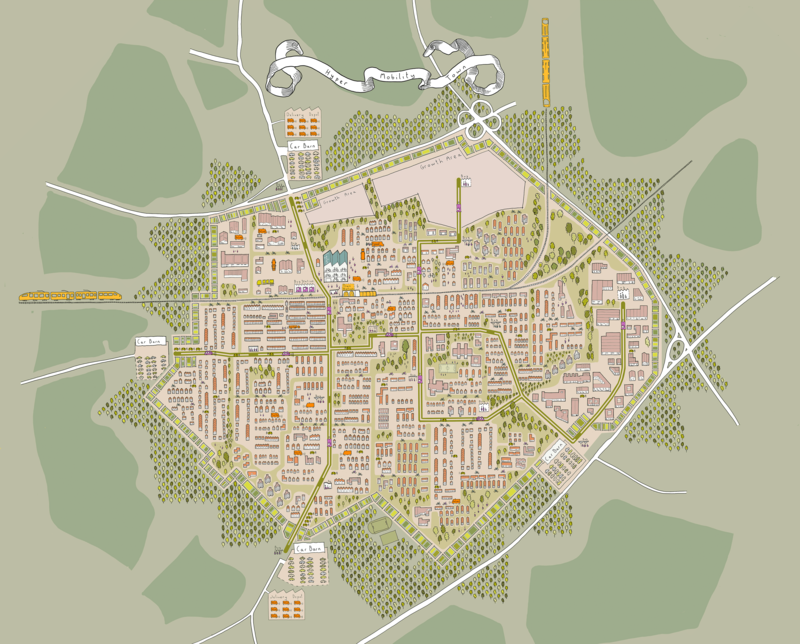 This is a fictional town, but there are many places of this size and shape in the Frankfurt Am Main Region. Flexible journeys and driverless technology could allow us to leave the private car “at the gate”. Within the town journeys could be made by driverless buses, walking and cycling. Driverless cars could also be used, but only by people who need them. The question is what does that do the the design of the town? So we returned to our maps and started to delete all of the car-based infrastructure. In the parts of the town that were built before mass car ownership nothing much changed, the robots just replaced the horses and carts around which it had originally been built. But for those modern neighbourhoods built to separate cars and pedestrians everything changed. Ironically our conclusion was that this meant that there would be more roads rather than less because the autonomous transport needed to get to every doorway. But because the vehicles would be unable to collide we didn’t need to worry about safety or mixing children’s play with these local roads. Indeed we could open up the deserted and rather threatening landscape areas by creating lively pedestrian streets. We might include more infill development to increase densities and build on all of the parking and garage courts. What we would create would be a new form of medievalism; a city built without the car resembling those cities build before the car. In doing so might rediscover the intensity and diversity of these cities, reinfecting all of those ingredients that have been squeezed out to accommodate our obsession with private cars. The city created by future transport is not inevitable it is ours to shape. Without the private car the spaces used for car parking and garages are now free. These spaces could be used to provide more housing and improve frontage onto roads.